The report by the American Tort Reform Association drops Florida to second place in favor of California. 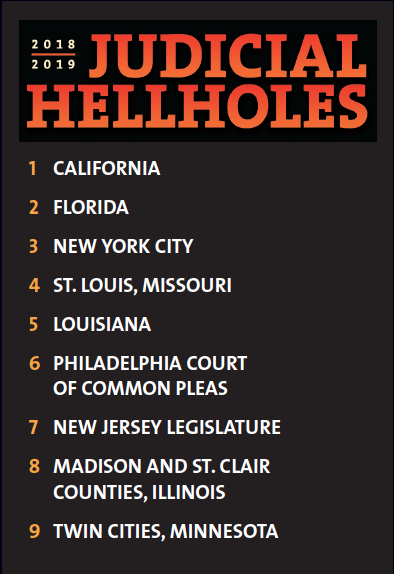 Florida has been displaced by California atop the annual “Judicial Hellholes” list formulated by the American Tort Reform Association defense bar organization. The association ranked the nation’s top nine venues with what it considers the “most unfair” legal systems. Florida, whose highest court came out with a bevy of medical malpractice decisions favorinv plaintiffs last year, fell to No. 2. New York City’s courts jumped to No. 3, while the Philadelphia Court of Common Pleas and the New Jersey Legislature, though not its courts, also made the list. Some overriding concerns in the report involved the prevalence of “junk science” at trials; class actions, particularly involving food packaging, which the defense bar insists have no injuries; and “activist” attorneys general who have brought cases over opioids and climate change. California has been No. 1 in prior years, often cited for its unique laws like this year’s data privacy statute. But the California Supreme Court’s Dec. 21 decision last year in T.H. v. Novartis Pharmaceuticals propelled it to the top of the list again. The ruling was the first to impose liability on brand-name drugmakers for the actions of generic pharmaceutical manufacturers, which the U.S. Supreme Court found in 2011 were protected from tort actions by federal pre-emption under Pliva v. Mensing. Florida stayed high in the rankings after the Supreme Court refused to adopt the more defense-friendly standard for expert evidence, named for the U.S. Supreme Court’s 1993 decision in Daubert v. Merrell Dow Pharmaceuticals, in its DeLisle v. Crane decision this year. But the report said the court is “poised to significantly shift” with incoming Republican Gov. Ron DeSantis ready to appoint three justices to the seven-member court. The four holdovers are Republican appointees. In contrast, the report praised decisions by the New Jersey Supreme Court, includig its ruling for the Daubert standard. Minnesota’s Twin Cities made the list for the first time at No. 9 because of an $850 million settlement in a groundwater contamination case. The settlement between Minnesota Attorney General Lori Swanson and 3M gave $125 million in contingency fees to outside law firms. The Minnesota Supreme Court also rejected the Daubert standard. St. Louis stayed on the list at No. 4, down one from last year, due to the Legislature’s failure to enact tort reform. The report also noted a $4.7 billion verdict against Johnson & Johnson over its baby powder. The report put the Georgia Supreme Court on the “watch list” after it upheld a $40 million verdict in Chrysler Group v. Walden this year. The Delaware Supreme Court got a “dishonorable mention” for its “take-home” asbestos ruling, and Texas trial courts for their large verdicts, including a $706 million trade secret verdict against a Quicken Loans affiliate. The report gave kudos — called “Points of Light” — to the U.S. Supreme Court for its decision this year upholding class action waivers in employment contracts and to the U.S. Court of Appeals for the Fifth Circuit for its reversal of a $502 million verdict on hip implants.